Hockney began making portraits and self-portraits at the age of sixteen, and he feels that “Faces are the most interesting things we see.” Hockney’s Portraits and People contains five chapters that focus on self-portraits, family portraits, lovers and friends (two chapters) and finally his work made with the use of a camera lucida. The book ends with sources of quotations, further reading material, a list of illustrations and finally an index. Although the book is restricted to portraits and figure work, it spans several decades, showing how Hockney’s style developed, and includes drawings, prints, paintings and photographic collages. Hockney’s portraits of artists Ron Kitaj (1975) and Richard Hamilton (1971) are sensitive line drawings that portray the sitters skilfully with the minimum of detail. Two pages further on is Portrait of an Artist (Pool with Two Figures) (1972), an acrylic on canvas where the prominent figure in a bright red jacket stands against a lush green hilly landscape. The contrast could not be greater. Hockney’s portraits of his mother are the works that made the greatest impression on me. Sometimes we see her as she sits in an armchair with a gentle smile; in other portraits she gazes intently at us. The most poignant one for me is a photograph of her sitting at the ruins of Bolton Abbey. She is wearing a raincoat with the hood up and her hands are sunk into her pockets. She is looking down and a little to one side and seems very much alone, although another pair of shoes is just visible at the bottom of the photo. Celia Birtwell, textile designer and life-long friend of Hockney, appears delightfully throughout Hockney’s Portraits and People. Again, it might be a delicate line drawing or a more colourful pastel drawing or painting. Like his mother, she often has a light in her eyes and a gentle smile. It is interesting to see some of the artists who have influenced Hockney, particularly in the final chapter “Through the Lens and Beyond.” Here, Livingstone explains how Hockney was influenced by the nineteenth-century painter Ingres after seeing an exhibition of his portraits. He was consequently inspired to experiment with a camera lucida to make fine line drawings. Four of Ingres’ portraits are reproduced opposite four of Hockney’s from 1999 and 2000; the similarities are surprising. It should perhaps be pointed out that Hockney is homosexual and the Chapters 3 and 4 on lovers and friends feature quite a number of full frontal male nudes. Normally this should be acceptable in fine art, but some people may find these pictures offensive. The text by Livingstone and Heymer is authoritative without being heavy going. As well as the main text, some of the illustrations have a paragraph-long caption giving detailed information. It is of course possible to get plenty of enjoyment from a book such as this purely from the illustrations, but I would recommend reading the captions as they give a fascinating insight into some of the works of art. An exhibition of Hockney’s landscape paintings begins at the Royal Academy in January 2012, so there is likely to be a significant amount of interest in his art. For anyone unfamiliar with Hockney’s oeuvre who is inspired by that show, Hockney’s Portraits and People will give a fascinating insight into an additional area of his work. It is a wonderful book for those interested in the major figures of twentieth-century art, and particularly for anyone interested in figurative painting and drawing. Although a hefty tome, it is one that will provide hours of pleasure for lovers of modern art. 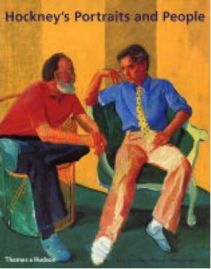 Kay Heymer has written the introduction to Hockney’s Portraits and People and also the text to the chapters on family and lovers and friends from 1977 to 1998. Like Livingstone, Heymer is an art historian and curator, and he organised an exhibition of Hockney’s work in Bonn in 2001. No Comments on "Hockney’s Portraits and People"